If your toddler has been used to the udderly brilliant award-winning anwayup® cow cup, he will adore a grown-up cow beaker now he is really on the moove! Using the best materials and tested to the highest standards. 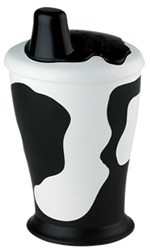 The anwayup® cow beaker is designed to develop independent drinking skills for the later stages of drinking confidence.